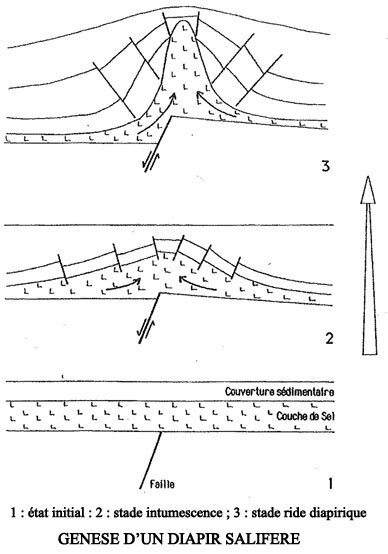 During its formation, the ground of the Salies-de-Béarn basin underwent a series of geological events that make it unique today. At the end of the Triassic age, 200 million years ago, the ancient continent of Pangaea, which constituted all dry land at that time, started to break up. The opening of a marine gulf, situated between the Iberian plate and the European plate allowed the waters of the Boreal Sea to flood what is now the Aquitaine basin. Under the effect of an arid climate, the Boreal Sea slowly evaporated, depositing the considerable quantities of salt that it contained. During the Jurassic and Cretacean geological eras, (200-145 million years ago and 145 to 66 million years ago respectively) the evaporation was less intense, giving rise to green and red or “wine lees” marls, marine animal remains, squid and corals were deposited above the salt, forming part of a clay cap that protected the underlying salt from pollution. At the end of the Cretaceous era, when the Pyreneean mountains were formed, immense faultlines spread out across the Béarnais ground. The salt, being more flexible than the rock, slipped through these faults, sometimes leaving dome-like intrusions or plugs at the surface, known as diapirs. With the passage of time, rain water gradally infiltrated the soil, dissolving the precious saline rock, crossing here and there some higher layers of clay and absorbing trace elements. 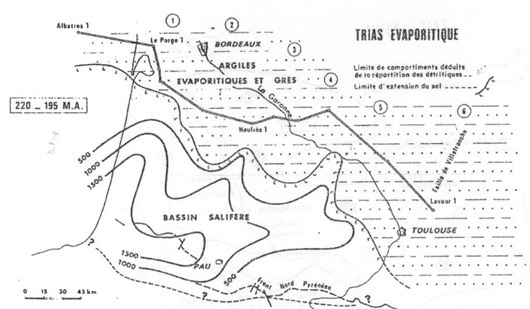 From this union of rainwater, salt rock formations and layers of clay loaded with trace elements are born the springs of Salies-de-Béarn, with their unique wealth of minerals. In fact, the saltwater springs of Salies-de-Béarn contain more salt than the waters of the Dead Sea, as well as being ten times more concentrated than seawater. This composition, being rich in mineral and trace elements, confers on the salty waters of Salies-de-Béarn recognised therapeutic virtues that have been used for the treatment of numerous conditions. 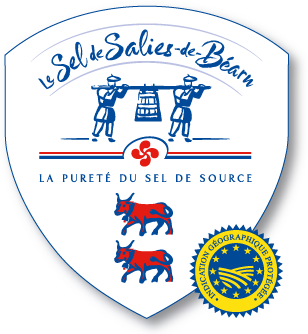 They have been used at Salies-de-Béarn since the first thermal establishment opened there during the 19th century. There have been three main fields of application: paediatric conditions, gynaecology and rheumatology.